I’m a big fan of reading the notes in galleries. It may make me an annoying person to follow around an exhibition (I’m also an irritatingly slow reader, sorry everyone), but I think the best art exhibitions are the ones where you not only enjoy the work, but find out something you didn’t know about the artist’s life and personality too. Because believe it or not, artists can be a pretty interesting bunch. So the Laura Knight exhibition at the National Portrait Gallery was a total treat. I knew of some of her more famous work; oil portraits such as Rose and Gold (below) in rich, jewel-like colours but I’d never realised how many different themes she covered. One thing that’s great about Knight’s work is that she delves into such a range of different cultures and ways of life, and although she doesn’t shy away from the less salubrious ones either. Her subjects range from stately old women and doe-eyed prima ballerinas to maudlin circus clowns and gypsies. This might be down to her own humble background. Born into an impoverished family in Nottinghamshire, Laura was taught to draw by her mother and when her father died . A magazine clipping from the time features the following anecdote: “once, she was so poor that she blacked her toe so it wouldn’t be seen sticking out of her worn out shoe”. I know this is an art exhibition and not the X Factor, but that’s one hell of an emotional back-story. When you realise that Knight was operating at the same time as modernist painters – she was admitted to the Royal Academy the same year it rejected Wyndham Lewis’ portrait of TS Eliot – you realise that, although her work often seems quite mainstream, it must have taken courage to stick to her more traditional guns. That’s not to say she wasn’t progressive in her attitudes, though; the sympathetic way she paints gypsies (below) and black patients at the John Hopkins hospital strikes me as quite modern. 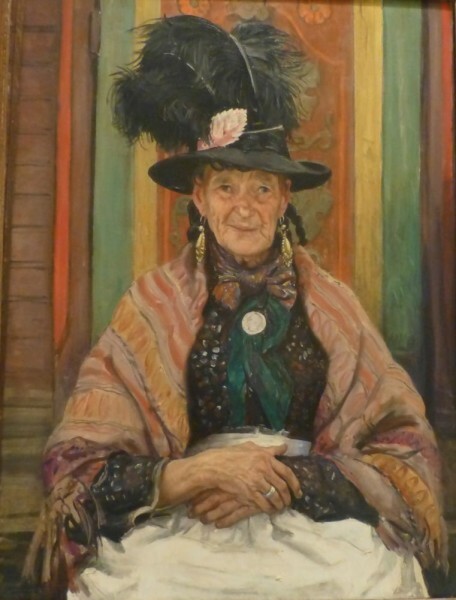 The highlight of the exhibition for me was the gypsy and circus portraits, where Knight captures this obscure corner of society in all its regal splendour. There’s a heavy dollop of romanticism in her portrait of Granny Smith (below), but I love the dusky colours and the parallels in pose and style with Knight’s portraits of society ladies. There’s still a strong element of traditional style running through her work, and this is most evident in her work during World War II. 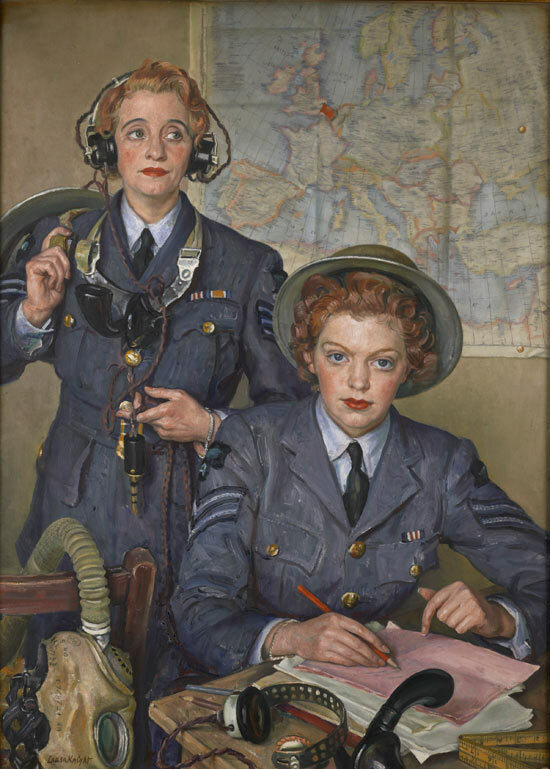 The propaganda portraits are twee and jingoistic – they were commissioned by the War Artists Advisory Committee – but there’s something incredibly strong and Rosie the Riveter-esque about the women they portray – especially Corporal Elspeth Henderson and Sergeant Helen Turner, (1941; seen at the top of this post). As Rachel Cook pointed out in the Guardian, it’s the slick of red lipstick that really makes it. Something that fascinated me about Knight is that, after the War, she requested that she be allowed to go to Germany and paint those on trial for war crimes at Nuremberg. She sat in the courtroom for months, and the exhibition has a great sketchbook drawing of Goering alongside a diary entry where Knight ponders whether she should smile at and acknowledge the war criminals she has come to recognise when their eyes meet across the courtroom. 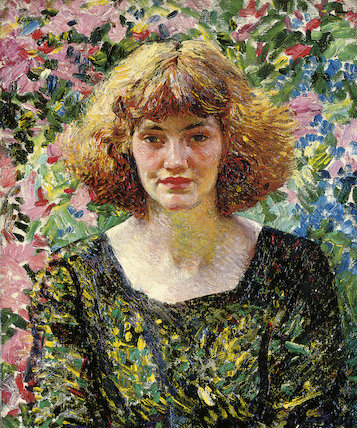 Although her portraits are powerful, I can’t argue that there’s anything ground-breaking in Knight’s style. But I think what endears me to her work is her desire to paint all sections of society and her confidence in her own style and what she wanted to paint. I can just imagine her sitting in the press box at Nuremberg (she pretended to be a newspaper correspondent), determinedly taking down every detail of these men’s faces, whilst her modernist contemporaries were back in London, painting each other in their insular circles. I’d bet there weren’t many middle-aged women in the 1940s who would volunteer to sit in on the Nuremberg trials, and her spirit is definitely something to be admired.